Small game from Australia belonging to a large collection of dice-based sports games devised by Hamish Sterling. 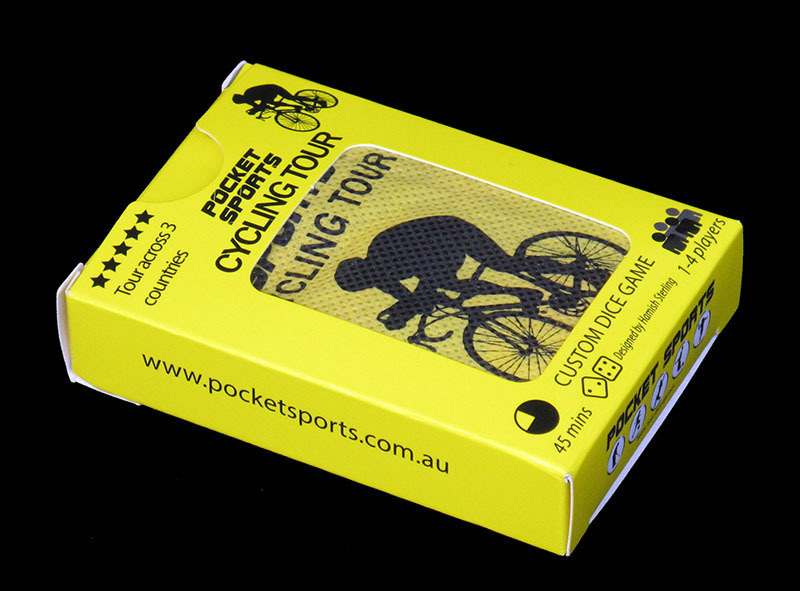 According to Hamish himself, "Pocket Sports Cycling is a simple dice rolling game that lets you take the handlebars of a rider in a cycling event". 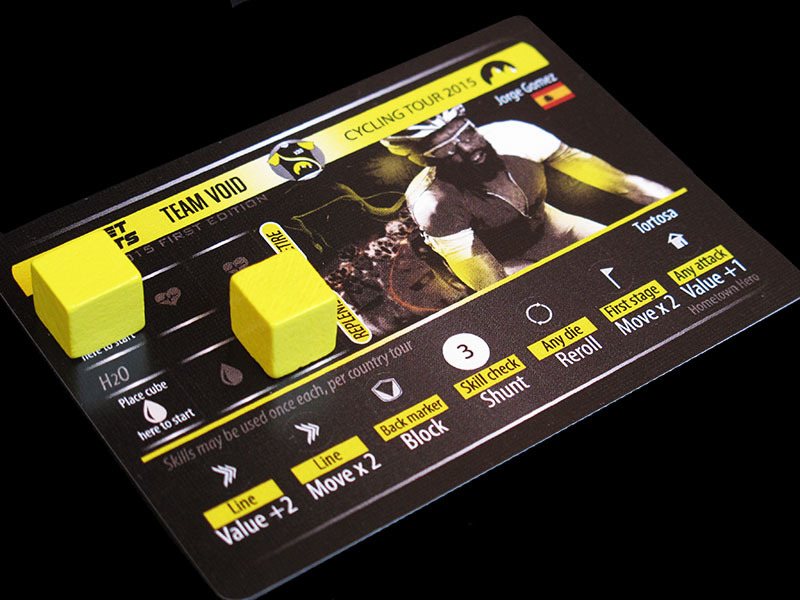 This game, which can be played in solo mode or up to 4 players, is supposed to consist of a Grand Tour that takes place accross 3 different countries with 42 stages. But then Hamish is the first to concede that he is not a big cycling fan. 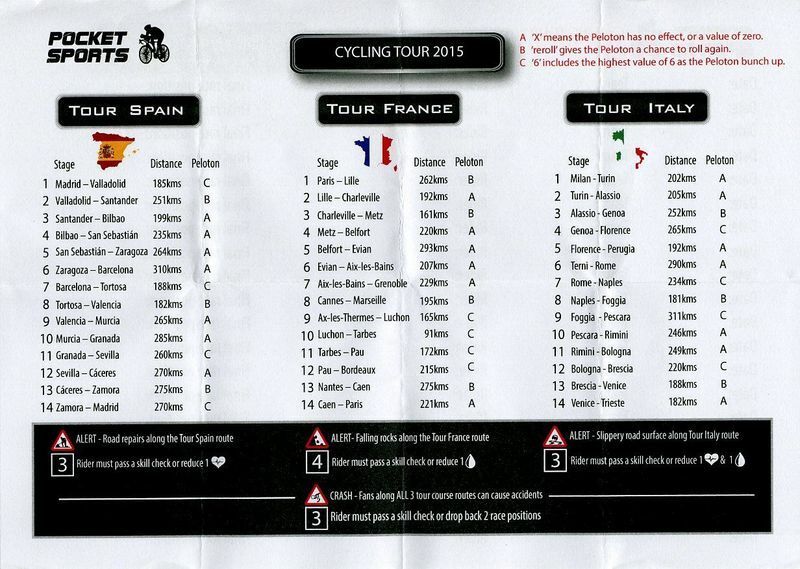 As I see it, this game represents a three-stage race with a short time-trial prologue. Seen this way, the game is almost realistic. 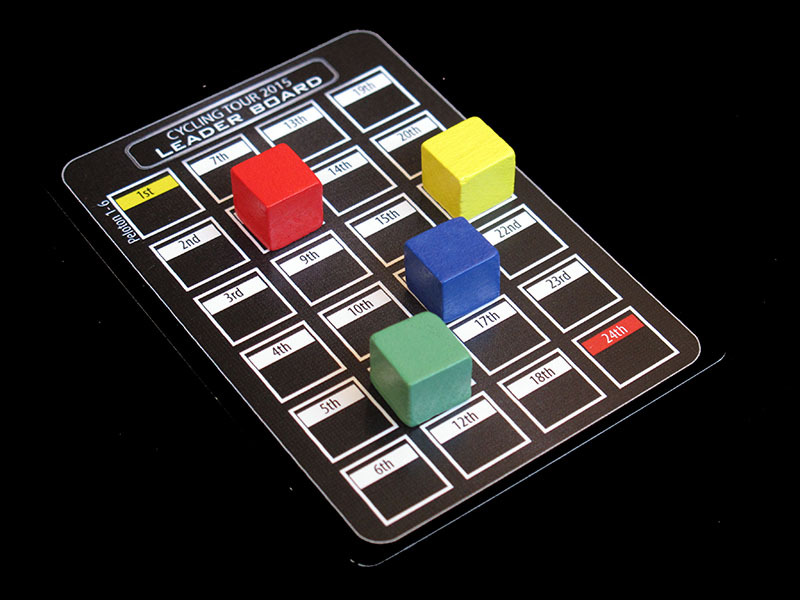 Inside the card-deck-sized box (it really fits in your pocket) you will find six different colour-coded dice, four team cards, a leader board, twelve wooden tokens, the rules and the list of stages. 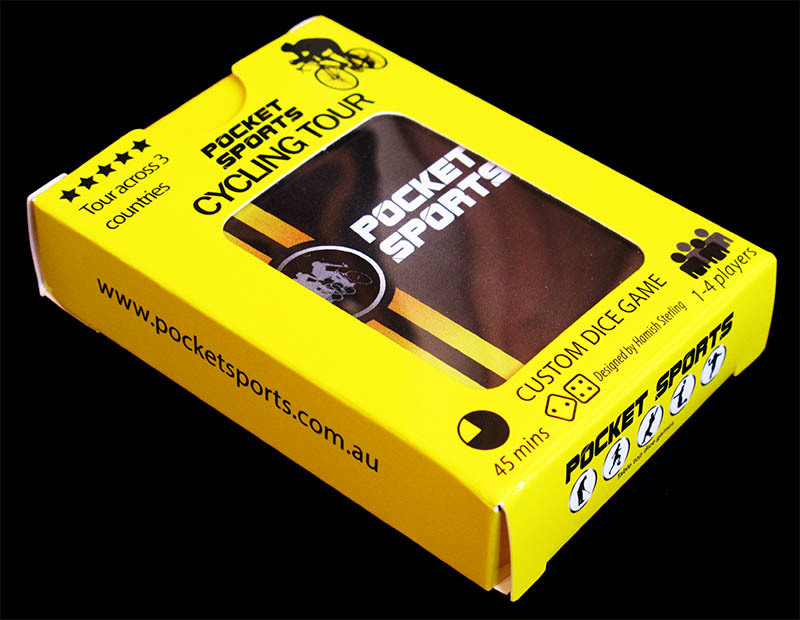 "Pocket Sports" honours its name. 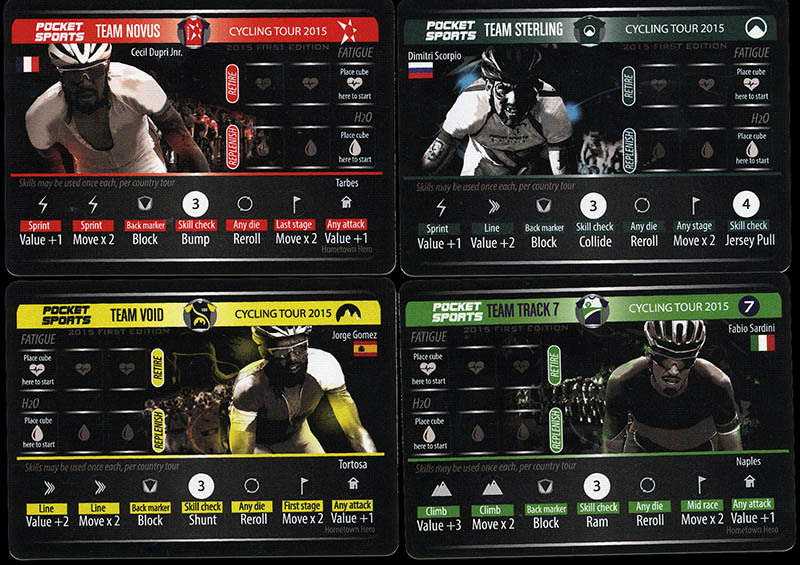 The rules are not so simple as one might think, at least they are different from most cycling games' rules, probably because the maker of the game has an outsider vision of the sport. The riders are placed in a position between 5th and 23rd (never better than that) after the time trial, and their goal is to "make attacking moves" and pass the riders in front one by one, hopefully into a podium finish place. It is not so easy to win the race! Probably the mechanics of these kind of dice-based games are better suited to other sports (the collection started with a cricket game), but in this game they work quite well all things considered. . The stage distribution is the unrealistic part of the game. There are slightly different rules (A, B and C) for every stage, but I tend to consider them different types of road in the same stage. The materials used for the game are of good quality. The part that I do not like that much is the box (other games in the series have leather pouches), but the cards and spacially the dice are well-made. I could collect all the games in the series (almost 20 at the time of writing). In a perfect world (you know: unlimited ressources to buy them , unlimited space to store them -not the biggest problem in this case- and unlimited time to play them), I surely would. 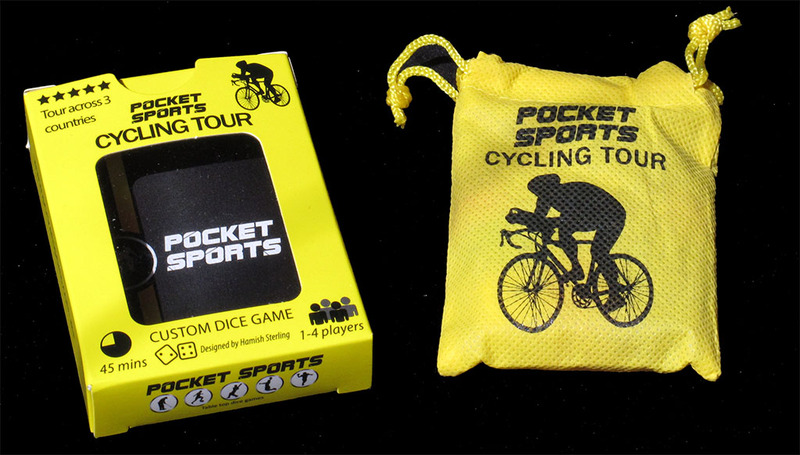 Most of the Pocket Sports games vame in a nice cloth bag, but unfortunately the cycling game did not. Now this has been solved and you can purchase the bag (separately, I am afraid). Unfortunately, not all the contents of the box fit in the bag. 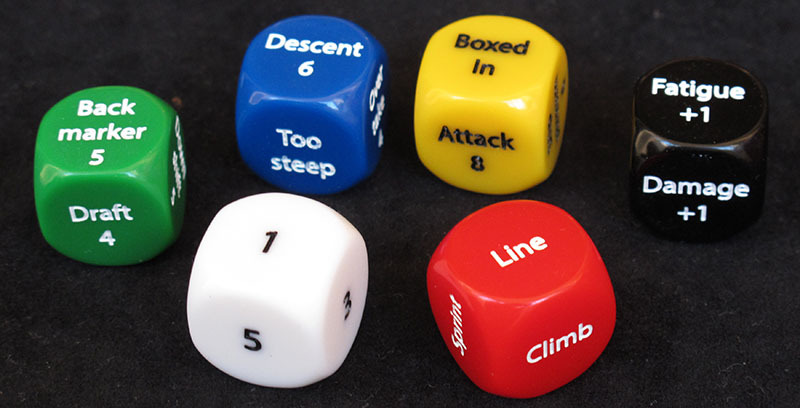 The dice and counters do, but not the cards: you still need the box to store the game in. On the other hand, the bag -with the dice and counters in it- fits nicely in the box.